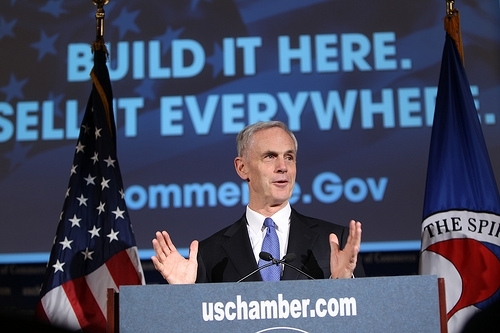 I had the pleasure of attending the Secretary of Commerce John Bryson’s speech at the U.S. Chamber of Commerce this past Thursday. Bryson laid out his plan for the Department, showing a strong focus on manufacturing exports as he begins his tenure as Secretary. The phrase of the day, which in many ways embodies the goals of the Department of Commerce’s International Trade Administration (ITA), was, “build it here and sell it everywhere”. After more than 43 years of real-world manufacturing experience at C.G. Conn and Steinway & Sons, I am excited to see the manufacturing industry receive the attention it deserves. As the Deputy Assistant Secretary for Manufacturing within ITA, enhancing America’s ability to “build it here and sell it everywhere” is something my colleagues and I work towards every day and I am excited about Commerce and the Administration’s renewed attention. Secretary Bryson discussed three areas in particular – supporting advanced manufacturing, increasing U.S. exports and attracting more investment to American from all around the world – that will help the U.S. create jobs, rebuild the middle class, and ultimately build a foundation on which the economy can recover. ITA has the opportunity to be a key contributor to the success of Bryson’s three-part vision. As the Secretary said, manufacturing is no longer about old assembly lines, but conceiving and creating innovative and advanced products. The manufacturing industry isn’t just responsible for building cutting-edge products, but the research and development that leads to the final form. In fact, manufacturing companies are responsible for 67 percent of all business research and development in America. The manufacturing sector not only provides more than 11 million Americans with jobs, but for every job inside a factory, at least two more are created outside of it. Our own Manufacturing Council considers the issues facing the success and growth of modern American manufacturing and has made recommendations regarding energy policy, workforce development and trade promotion policies. Possibly most encouraging, was Bryson’s concentration on efforts to expand American manufacturing businesses’ access and use of foreign markets. As Secretary Bryson mentioned, 95 percent of the world’s consumers live outside of the U.S., yet only one percent of our businesses export. ITA works hard to assist businesses interested in exporting by simplifying the process. We provide services for exporting businesses including helping them find reliable export financing, connect them with opportune foreign markets and deal with often complicated foreign rules and regulations. The power of exports is evidenced by the success of President Obama’s National Export Initiative (NEI) which has already helped U.S. businesses increase exports 17 percent in 2010 and 16 percent so far in 2011. Bryson also highlighted ITA’s continued effort to find creative ways to grow U.S. manufacturing businesses through international trade. The Global Buyers Initiative partners ITA’s Commercial Service unit, their foreign counterparts, and FedEx to match the shipping company’s foreign customers with U.S. suppliers. We eagerly await the results of our pilot programs currently being implemented in France, Canada, and South Korea and will hopefully expand the program worldwide in 2012. Bryson’s final area for growth is direct foreign investment. While direct foreign investment may mean bringing companies into America from outside our borders, it also means more American manufacturing jobs and exports. I applaud Secretary Bryson for recognizing the importance of attracting investments by using our already well-positioned foreign commercial service officers and better showcasing what we have to offer. Initiatives such as SelectUSA are already working to disseminate information and services to potential foreign investors. Through SelectUSA and other programs, ITA is continuing to work to ensure the world knows the United States is “open for business”. You can read the full text of Secretary Bryson’s speech here.